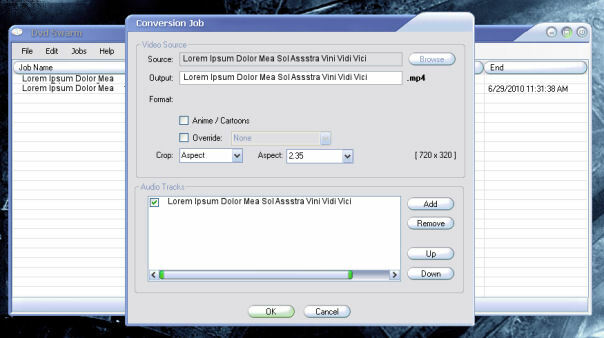 DVD Swarm allows you to convert DVDs to MPEG-4 AVC/H.264 video with AAC/FLAC/Vorbis in a MKV or MP4 container. Added processing override 'Pal To NTSC' for really foobar'd PAL videos. Fixed bug that caused PAL jobs to be loaded as NTSC. Fixed formatting of audio sample rate names. Removed the MOD 4 restriction of manual crop values. Removed the MOD 16 restriction on height and width values. The Mod 16 warning dialog will still display, but will now accept any value specified. Adjusted x264 CRF values for improved crispness of details and more fluid action scenes. Increases file size and encoding time by approximately ~15%. Added menu option to set the processing override for multiple jobs.